All roads lead to the canal! Last week we discovered all roads really do lead to the canal network as we held the official handover of the Mikron Theatre Company archive into Heritage Quay! 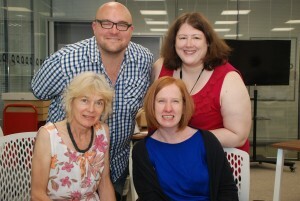 The acquisition of the Mikron archive has been almost four years in the making, from a number of coffee shop chats in its hometown of Marsden between producer Peter Toon and Huddersfield academic Heather Norris Nicholson, to the transfer of over 60 boxes of material into the University of Huddersfield Archives in March 2015. We’re often asked how we acquire collections, and whilst many depositors approach us directly, and on occasion we might approach a potential depositor, it’s far more usual for us to hear about potential acquisitions through word of mouth. Colleagues and users of the archive service will often flag up our existence to those perhaps considering depositing an archive (or those who have never considered it but wish they had somewhere safe to keep their collection! ), but with no prior experience of the process or potential of depositing a collection with a professionally run archive service. In the case of a University archive service, it is often through the connections made by our academics that we are made aware of these potential depositors. It was through Dr Norris Nicholson’s initial discussions into the contents of the archive during 2011 and 2012, and her discovery of the potential for research amongst students and academics from a number of arts disciplines that a new home at the University Archive Service began to take shape. 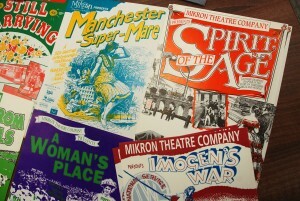 A modern theatre company for whom travelling was a large and integral element of their day to day life, the practical advantages to Mikron of being able to regain office space, alongside the desire to be able to make parts of their fascinating history available to fans and researchers alike made the possibility of the archive’s move a serious prospect. But Rome wasn’t built in a day, and neither is the transfer arrangements for an archive collection! It often takes months to arrange the practical and legal elements of a deposit. The HLF funding to move the archive service to a new facility gave the idea of the deposit both a boost (considering Heritage Quay’s new location looking out onto the Huddersfield Narrow Canal and Mikron’s long connections with waterways in general) and created a delay. It was decided best to move the material once the centre was complete and the existing collections had been transferred into the new repository. 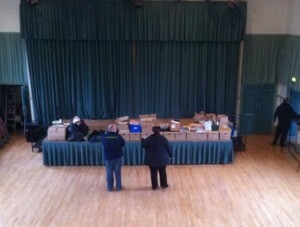 Mikron’s archive leaves its home at Marsden Mechanics for a new existence in Heritage Quay. But on a rather cloudy March morning in 2015, the Mikron archive left its home at the Marsden Mechanics for the last time, to be catalogued, repackaged and stored in the new state of the art facilities at Heritage Quay. During the official handover on the 30th June, Dr Nicholson (Visiting Researcher, University of Huddersfield), Peter Toon (Producer, Mikron) and Marianne McNamara (Artistic Director, Mikron) came to look over some of the transferred material and examine the new repository. Peter and Marianne were excited about the prospect of not only the material becoming accessible to a whole new audience of users, but the potential for them to be able to use and re-visit material from the past. 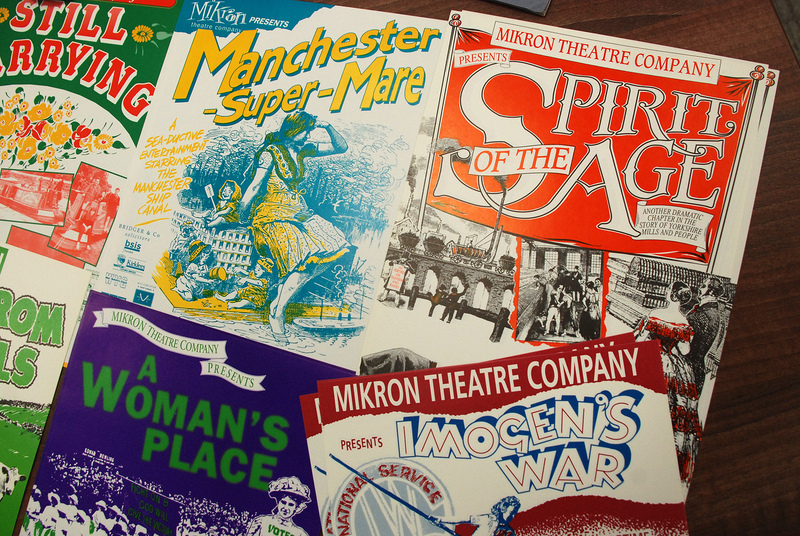 Mikron has one of the longest independent theatre ‘Friends’ group in the UK, which will celebrate it’s 30th anniversary in 2016, and some of the very first newsletters from the 1980s were on display during the handover. Dr Nicholson pointed out the relevance of the programme and poster collections in charting the history of design and colour choice for Art and Design students. She also discussed an extensive set of oral histories conducted with those living and working on the barges in the early 20th century, which told not only the history of the waterways, but that of a entire culture of ‘bargee’ people who are now represented by only a few descendants keeping traditions alive. As the vinyl, audio tape, programmes, photos, administrative and textile contents of the archive were reviewed, Dr Nicholson concluded the strength of the Mikron collection lay in the diverse range of formats it encompassed, which had appeal to students across the arts and humanities disciplines, and the potential for inter-disciplinary and funded research projects in the future. In addition to dramatic and historical interest, elements of Mikron’s advertising and production history holds interest for Art and Design students. So the Mikron collection is now safely on the shelves in its new home, and we hope to have it catalogued shortly. The collection will then be searchable in the online catalogue at heritagequay.org, and also in the lists we upload to portals like the Archives Hub and Archives Portal Europe. Whilst we hope to welcome many students and academics in to conduct research, we also look forward to sharing the contents of the archive with Mikron’s Friends and the local community. We hope if you visit Heritage Quay in the near future, you too will find all roads lead to the canal! Read the University’s press release here and find details of Mikron’s show One of Each at Heritage Quay on 8th October 2015 here. This entry was posted in arts, Blog, News.